Our high quality and professional-looking engraved signs allow new and old clients to identify you as a notary public immediately. With a position that is taken very seriously, you need a sign to reflect your status. 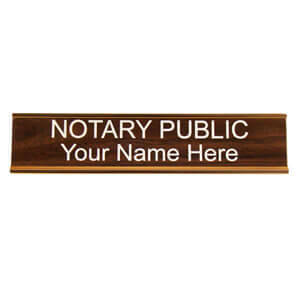 Notary Supplies Online offers several styles of professional notary signs that are sure to appeal to you. 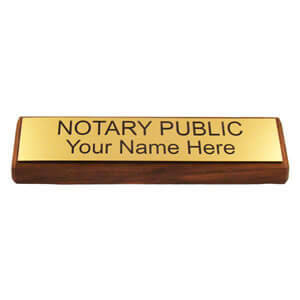 Proudly display your status as a Notary Public on your desk with this stunning gold and walnut tri-block sign. With the addition of your name, this polished sign features the phrase "NOTARY PUBLIC" and is sure to bring you more business. This slim and professional looking sign is a great addition to your home or office. Made to order with quality materials, this Walnut Notary Public Sign is sure to turn heads. Your clients will enjoy the extra touch of professionalism when they read your new sign. If gold is not your color, you are sure to love this sleek Silver Desk Notary Sign with Silver Holder. The sophisticated silver background is engraved with black lettering in a distinct font that is sure to stand out in any environment - whether at home or in the office. 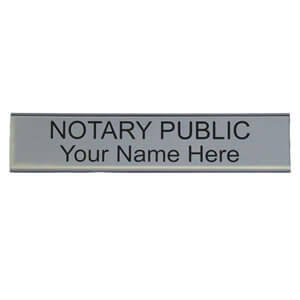 Mounted in a silver holder, this notary sign is a great way to proudly display your certification as a notary public.